Today we’d like to describe a tool which is very useful for Magento merchants who run brick-and-mortar stores. With the help of Store Locator, you let customers find the nearest offline locations where they can purchase your products. Stores are displayed on a Google map, and you can even specify some additional data for each one. Also, don’t forget to check our Magento 2 Store Locator Extensions Comparison, where we compare Amasty’s Magento 2 store locator module with corresponding extensions from Aheadworks, Magestore, and M-Connect. There are lots of various extensions of this kind (including free modules), but we think that the Amasty Store Locator stands out of the plethora of competitors due to two factors. First of all, it is easy to use. You don’t have to waste hours of time configuring each offline location. Furthermore, if you already have appropriate data, you can easily import it via CSV within a few clicks. If not, the manual creation of offline locations won’t take much time. The second reason we like the Amasty Store Locator Magento 2 module is its flexibility. There are lots of parameters to configure so that you can provide store visitors with all the necessary information about each brick-and-mortar store related to the ecommerce one. Due to the ability to create custom attributes, each location can be described as much as possible, and visitors get a perfect opportunity to filter out the selection rapidly discovering what they are looking for. Different colors for various store clusters. With this Magento 2 store locator extension, you will provide your buyers with the most reliable and convenient way to look for your physical stores. The module lets customers find the nearest offline shop in a few clicks. 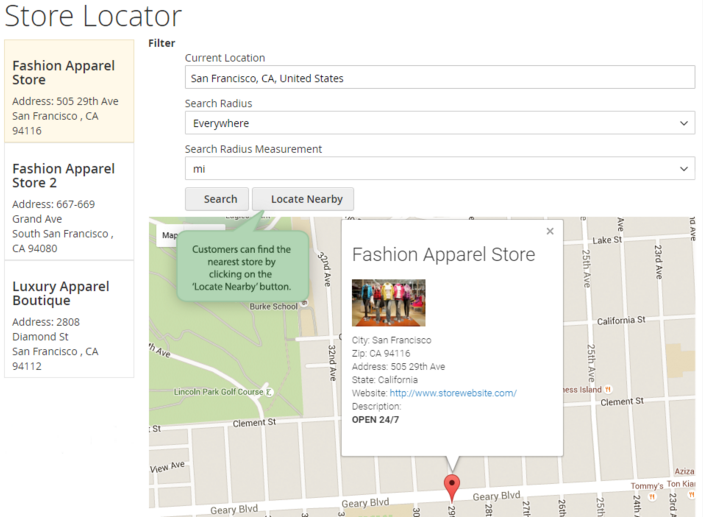 On the Magento Store Locator page, there is the ‘Locate nearby’ button. After clicking it, the plugin displays the list of locations sorted by geo position and shows them on a map. Furthermore, your clients can set a search radius in kilometers or miles to customize the results according to their specific needs. Store Locator for both Magento 2 and Magento 1 provides the ability to create as many store locations as you need. For each location, it is possible to set a name and an appropriate store view, specify country and city, as well as add contact information (phone number, email address, exact address), additional description, custom image, URL, and sort order. To check if everything has been set correctly before making a location visible to your customers, the Magento 2 store locator extension offers a backend preview map. If you’d like to display your offline shops in the most precise manner, you can specify geographical coordinates for each store location manually. Alternatively, you can use the ‘Auto Fill’ option. It is also worth mentioning that Amasty Store Locator provides the ability to assign specific products to specific store locations. 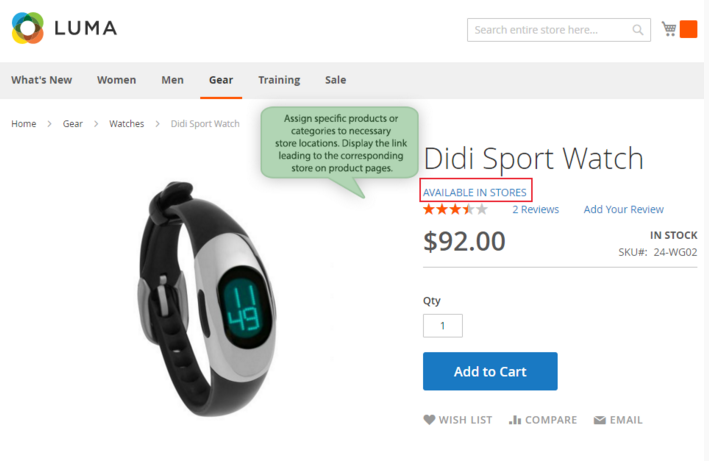 Thus, a link to a corresponding store location is displayed on an appropriate product’s page. As a result, your customers always know where to get the desired goods. If you have neighbored stores, there is an automatic map clustering option available with both Magento 2 and Magento 1 versions of the store locator extension. It unites them in ‘clusters’ and highlights with different colors to avoid visual map overload. In addition to the ‘Browser location’ feature, Amasty Store Locator can detect store visitors’ location on the basis of a CSV file with GeoIP data. Both options can be used simultaneously. The GeoIP feature requires the following files: GeoLiteCity-Blocks.csv and GeoLiteCity-Location.csv. Both can be downloaded on the official extension’s page. If you want to redirect customers to information according to their geolocation, you can use the GeoIP Redirect extension. 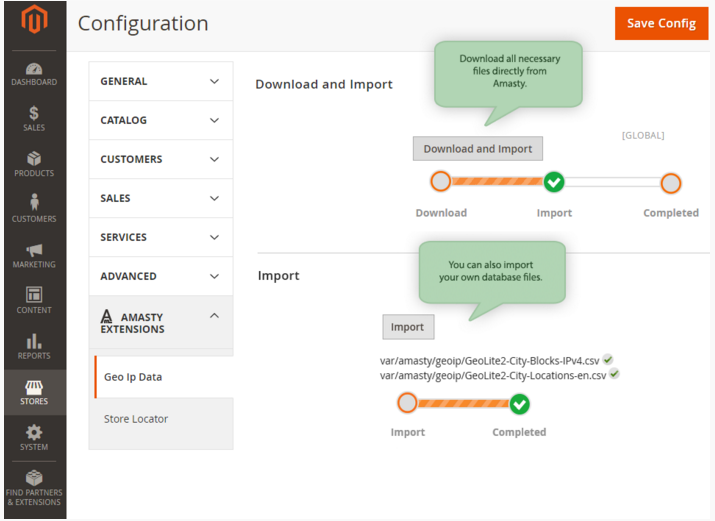 To configure the Amasty Store Locator Magento 2 module, go to Stores -> Settings -> Configuration -> Amasty Extensions. Under the Geo IP Data tab, you can download and import a file with Geo IP data from the extension’s database. Alternatively, you can import your own file. As for Store Locator settings, they are divided into three sections: General, Geolocation, and Main Settings. The first section allows you to specify a URL for the frontend locator page. You can make it both SEO and visitor friendly by adding meta description and meta title. In Geolocation, you can enable/disable the usage of Geo IP and the detection of a browser location. The Main Settings section contains more options. First of all, you can select which distance units to display. The Amasty Store Locator Magento 2 extension allows choosing between miles and kilometers. Alternatively, you can let customers decide on the most convenient measurement system. Next, it is necessary to create a Google mark template (a template for the Google mark that will be displayed for each store location in a popup) and an attribute template. Frontend product URL text is another field available in Main Settings. After specifying this parameter, decide whether to open frontend URL on a new page or not and type Google API Key. You can also enable showing additional attributes, such as phone number, URL, and email, in the list with your stores. Besides, you can create text for shops not working on a specific day and specify search radius. Now, let’s go to Content -> Amasty Store Locator -> Store Locator. All your offline locations are gathered here. The grid displays location ID, store views where the location is shown, its status (Enabled/Disabled), name, city, zip, address, and position on the frontend. Each location page consists of 5 tabs: General Information, Location on Map, Available Products, Store Schedule, and Store Attributes. On the first one, you can specify location name and store view to display the Magento 2 Google Maps store locator there. Next, specify location’s country, state, province, city and add a description. For example, you can inform about a sale there or attract the attention of customers in another way. Then, specify other contact details: zip, address, phone number, email address, and website URL. Enable the location, type its position for the frontend appearance, and upload images. 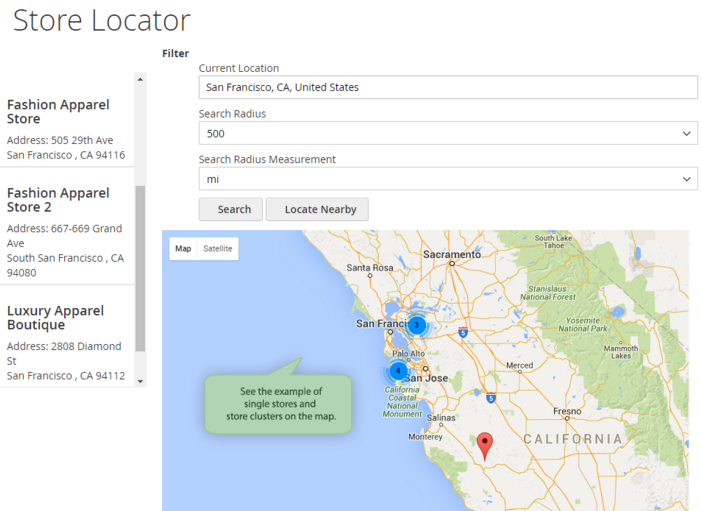 In Location on Map, specify latitude and longitude values for location coordinates. Alternatively, you can use the Auto Fill button. Here you also upload a file for a map marker. In Available Products, specify categories and products linked to the offline location. You can use different attributes to make the selection more precise and fast with this Magento 2 store locator extension by Amasty. 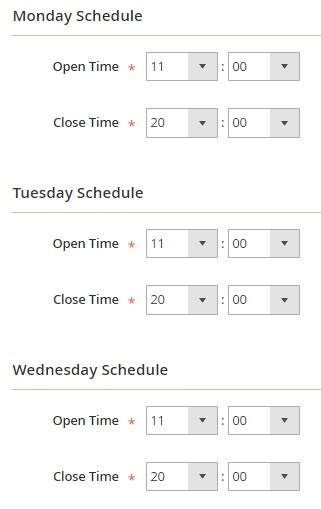 To specify store working hours, open the Store Schedule tab. Here you can determine opening and closing time for every day of the week. If you want to indicate weekends, set both open and close time to 00:00. 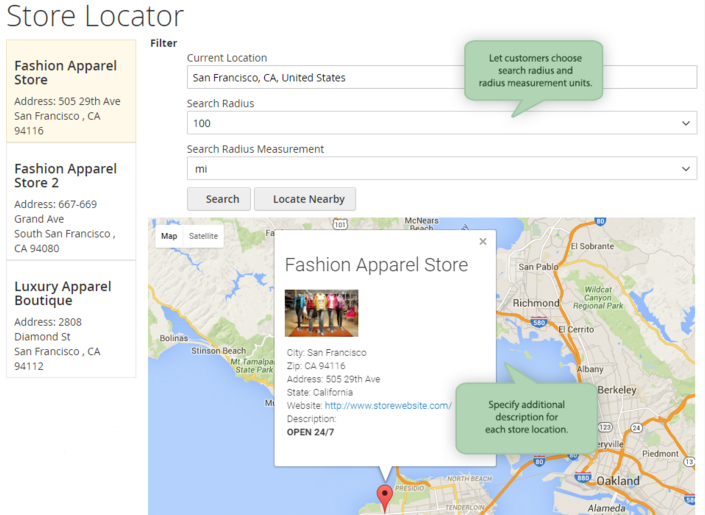 In Store Attributes, you can provide customers with useful data about the location. For instance, the Amasty Store Locator Magento 2 module allows displaying information about parking availability (set “Parking Availability” option to “Yes”). Next, you can provide store visitors with the information about available payment methods. It is also possible to select a day of new arrivals, as well as highlight brands available in the offline location. The availability of ATM can be displayed as well. 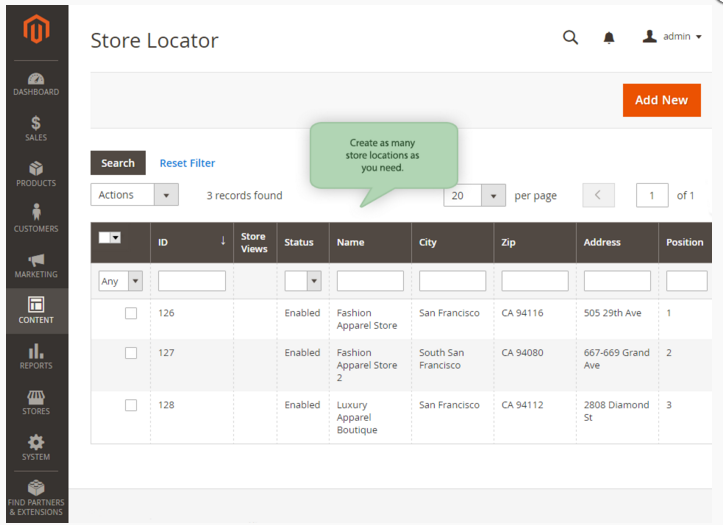 The content of the last tab can be modified under Content -> Amasty Store Locator -> Store Locator Attributes. There is a grid that contains the mentioned above store attributes. The Amasty Store Locator Magento 2 extension allows editing each of them, as well as adding new ones. 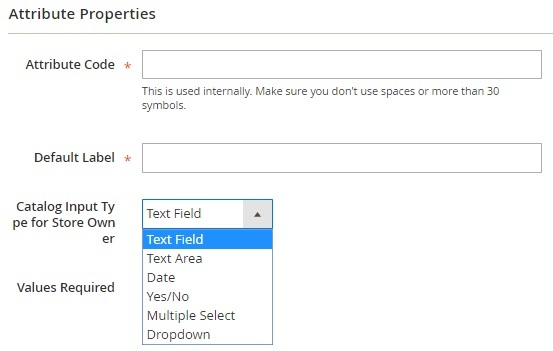 To add a new attribute, specify its code (will be used internally), type in a default label, select an input type (text field, text area, date, yes/no, multiple select, dropdown), and decide whether it is required or not. For multiselect and dropdown types, add options to choose from. Under the Manage Labels tab, you can create store view-specific labels. It is especially useful if you have websites translated into different languages. Note that it is possible to import location data under System -> Data Transfer -> Import. In Entity Type, select Amasty Store Locator. Next, configure import behavior. 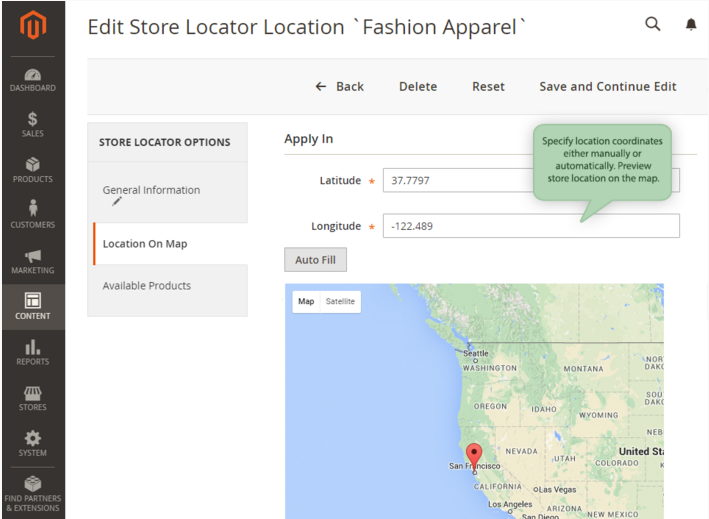 You can add/update, replace, or delete the existing data with the Magento 2 store locator module. Besides, it is possible to stop the import process if an error occurs. Alternatively, you can skip errors (specify allowed errors count). Also, enter the field and multiple value separators. Then, select a file to import and specify a path to the images directory. Now, when you know how to configure all offline locations, let’s proceed to the frontend section of the Magento 2 Google Maps store locator extension by Amasty. While on the frontend, you can search offline stores by entering your current location and specifying a search radius. You can also use the Locate Nearby button. Besides, you can apply attribute based filters that we have mentioned above. Note that each location is displayed on a Google map. Click a store in the block on the left, and the map will show it in more detail with a popup containing additional information, including address and description. Store name and work time are specified in each block on the left. Meta description can be added to a store locator page. Now all location related fields can be shown in a popup. 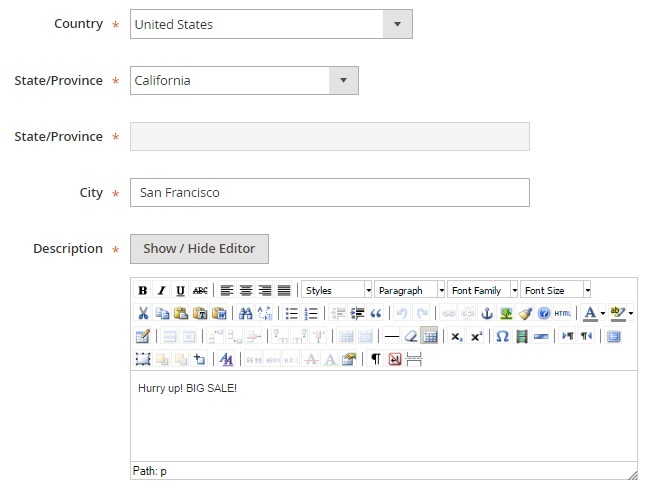 New option: specify a text to be displayed when a store is not available on a specific day. Current store location is available when a page is loaded. Default search radius can be set now. The improvement was made: now a state is shown on the location list. Additional attributes like email, phone number, and website URL can be added to the store tooltip now. Possibility to add a custom marker on the map for each store was added. Possibility to add a phone number or an email on the store list in the sidebar was implemented. A tag functionality was added to provide additional store information (parking, payment methods, brands, and so on). 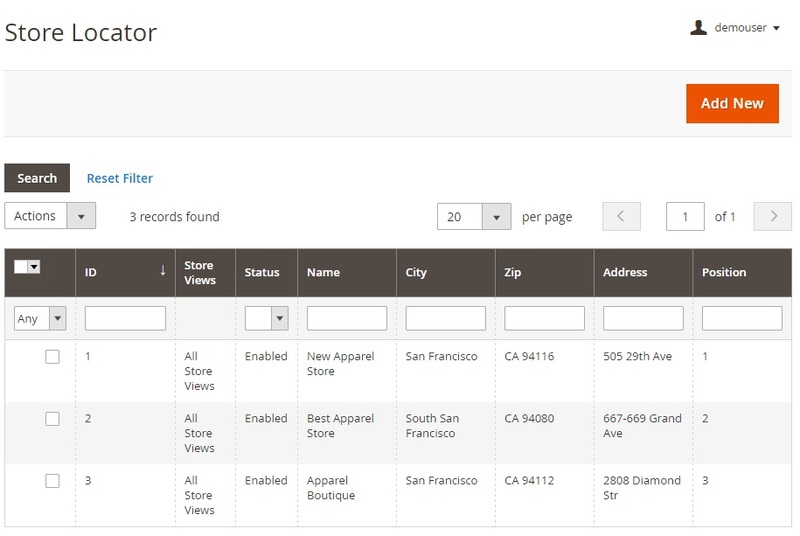 Filter by custom store tags on a store locator page is available now. A possibility to add opening and closing time for each store was implemented. The CSV import functionality was added to create or update store locations and store data instantly. 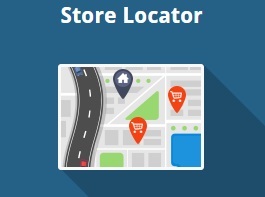 In case you have some brick-and-mortar stores connected to your ecommerce business, this Magento store locator extension is a must. Amasty Store Locator will significantly improve user experience and make your buyers more loyal. The Magento 2 module costs $199, and for this price you get 3 months of free support. For additional $79, it is possible to extend the support up to 6 months; for $129 – up to 1 year.